Here’s the latest version of the cover. Soon, I’ll write something about the image (it’s from a painting by Rembrandt), and why we chose it for the cover. To see it properly, click on the image. I have been silent here for a while, finishing my book and getting the manuscript to the publishers. It’s now there and in production. The publishers and I have been working on the cover and blurb. Nothing is set in stone as yet, so if anyone has any feedback on what you can see here, I’d love to hear it. Stories matter. Stories speak about complex aspects of our lives that intuitively we know are important but for which the language of rational discourse is often inadequate. Stories draw on archetypal structures and evocative language in ways that create affect: they penetrate, provoke, and disturb. This is a book of nine stories about teachers and students. A young woman sits in her first teacher-education lecture and wonders what kind of a tribe she is joining. A preservice teacher clashes with his mentor teacher on a practicum. A teacher and students inhabit an online space with unpredictable consequences. Sally discovers the Universarium. Joseph writes a story that undoes his therapist. Sylvia struggles to free herself from an oppressive discourse about the nature of teaching. Two siblings support and console each other through their complex inductions into classroom lifeworlds. A secondary student goes missing and police, the media and his teachers wonder why. A teacher-education academic wrestles with elusive ideas in order to prepare a lecture that he hopes will make a more-than-passing impact. There is no other book like Imagined Worlds and Classroom Realities. It not only tells nine gripping stories; it also both positions these stories as part of a growing scholarship about story-telling, and provides practical ways of using the stories in teacher education and professional development. Steve Shann is a teacher and writer with over forty years experience in primary, secondary and tertiary classrooms. For weeks, now, he has been trying to understand this weird concept. He’s read about it in Anti-Oedipus, and more recently in A Thousand Plateaus. He’s read commentaries, and even tried to write about it on his blog. For a while, it was a concept that kept slipping out of his grasp: one moment he’d think he got it, the next he’d read something that made it obvious that he was still a long way off. And then – and wasn’t it like this with much of learning generally? – this accumulated tangle of confused and jumbled thoughts about what the term could possibly mean suddenly resolved itself, almost overnight, through no disciplined synthesis constructed by his conscious mind. One morning he woke up, picked up a commentary on the concept of the Body without Organs, a commentary that he’d already read and highlighted several times, and this time it all made sense. Even more satisfying was the realisation that it was saying something about his memory of that hot Friday afternoon in his second year of teaching, and that perhaps it might say something useful for beginning teachers. All bodies seek to persevere in their own being (the phrase is Spinoza’s). Each body, to use Deleuze and Guattari’s way of saying this, is a desiring-machine seeking to join with other desiring-machines in order to increase flows of intensity. At a certain point, however, bodies find themselves organised into relationships and couplings which constrict libidinal flows, and there’s an instinctive and often unconscious move to create and occupy what Deleuze and Guattari call the Body without Organs (the BoW), but which might perhaps more accurately (but clumsily) be described as ‘A-milieu-less-constrained-by-organisation’. In A Thousand Plateaus, Deleuze and Guattari speak poetically rather than logically about this BwO. … you have one (or several) … you make one, you can’t desire without making one … It is not at all a notion or a concept but a practice, a set of practices. You never reach the Body without Organs, you can’t reach it, you are forever attaining it, it is a limit. … on it we penetrate and are penetrated. … The BwO: it is already under way the moment the body has had enough of organs and wants to slough them off, or loses them … the BwO is also full of gaiety, ecstasy, and dance … Where psychoanalysis says “Stop, find your self again,” we should say instead, “Let’s go further still, we haven’t found our BwO yet, we haven’t sufficiently dismantled our self. It’s what first Andrew, and then the rest of the class, were discovering and then occupying on that Friday afternoon. They, and their teacher, both found and created a space where behaviours were not organised from without, where there was license to experiment, create and play. It was a move towards a de-stratification in order to allow for more flow, greater intensities, a more animating experience for a body. … It is where everything is played out. … A BwO is made in such a way that it can be occupied, populated only by intensities. Only intensities pass and circulate. …The BwO causes intensities to pass; it produces and distributes them in a spatium that is itself intensive, lacking extension. It is not space, nor is it in space; it is matter that occupies space to a given degree – to the degree corresponding to the intensities produced. 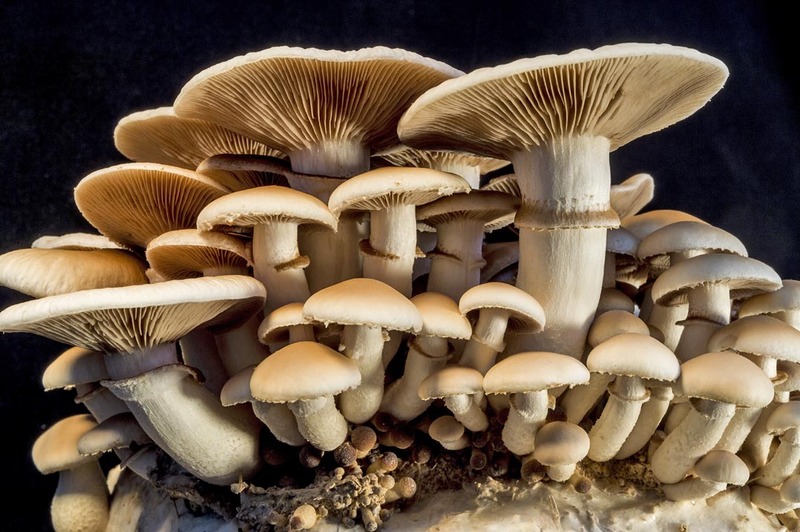 It is nonstratisfied, unformed, intense matter, the matrix of intensity … That is why we treat the BwO as the full egg before the extension of the organism and the organisation of the organs, before the formation of the strata … the organs appear and function here only as intensities. Such a strange, unsettling, subversive concept. And what do they mean that they ‘treat the BwO as the full egg before the extension of the organism’? Again he thinks about the steamy atmosphere in the classroom on that February day, and the dormant energies of those boys slumped at their desks. The soupy mix in the egg, the soupy mix in the classroom: a milieu out of which new organisms take shape (become extended?). He and the class, in those minutes following Andrew’s question, were making their own BwO. 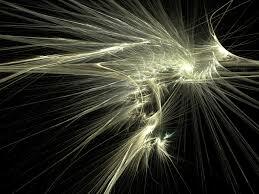 They were freeing themselves from a previous way of being organised (by a teacher, a classroom, a curriculum, a task), and creating the right conditions for energies (potential intensities) to be released and to flow. 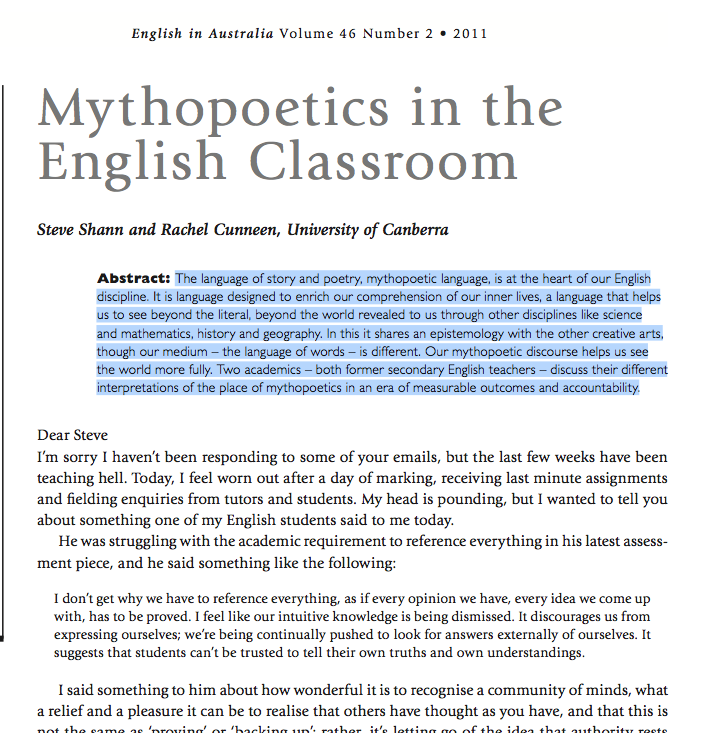 Brenton Doecke has just published a review of a recent book on English teaching. The review is wonderful; the book sounds timely. Both are deeply encouraging. The review’s title is ‘A new beginning?’, and we English teachers need a new beginning. In staffrooms, in the press, around dinner tables, in syllabus documents and rubrics, we are subjected to discourses attempting to define our job as if it were some offshoot of science: examine the elements of a text, closely observe the evidence, construct logical analyses of author’s intent and the techniques used, etc In the week which marks the passing of Maxine Greene, it’s good to be reminded that the function of literature is not to crawl under the microscope but ‘to awaken, to disclose the ordinarily unseen, unheard and unexpected’. (Releasing the Imagination, p28). Literature, she says, resonates. Our job as English teachers is to make available the forms with which the life within our students (already resonating, even if wordless) might be expressed, and to help those same students receive the resonances from the words around them. This is what (it seems to me) Doecke and Yandell are reminding us of. A new beginning? Yes. But a new beginning of a once-vibrant sense of what it meant to be an English teacher. 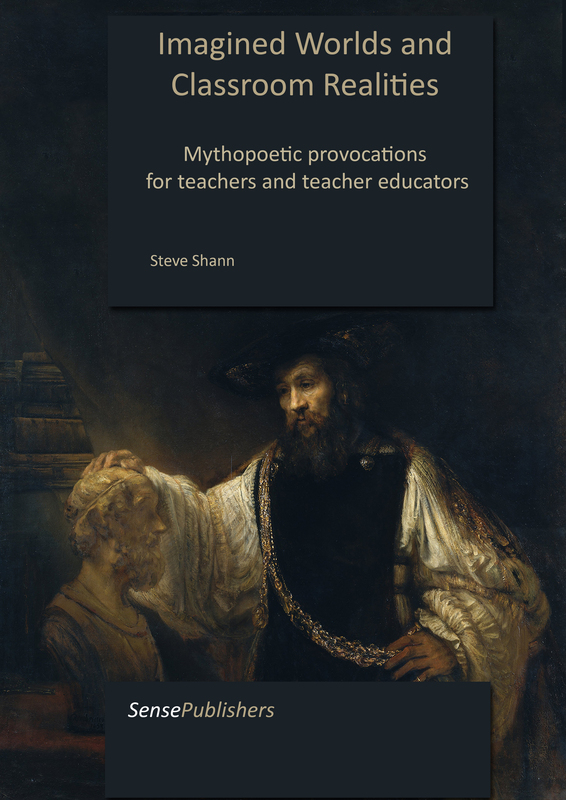 The review, and the book, tell the story of two English teachers who know that ‘at the heart of the work of every committed English teacher is a capacity to suspend his or her preconceptions about the value of a literary work in order to entertain other interpretations’ (140). It’s the story of teachers who enable their students ‘to make the set texts their own’, who know how to help their students ‘locate these texts in their own life-worlds’ (141). Doecke reminds us that this version, while underrepresented, is ‘recognizable’. I hear it in the discussions of beginning English teachers when they talk about why it is they wanted to become English teachers, and when they attempt to visualise the kind of English teacher they want to become. They’re motivated by their own love of words, and by the energetic contribution this love has made to their own lives. These young teachers are in danger, of course, of being swamped by the more dominant discourses shaping our curricula and classroom practices. But there is (I want to believe) a potential army out there ready for Doecke and Yandell’s ‘new beginning’. I’ve been thinking recently about how thoughts are formed, how they move from something vaguely intuited or perceived to being more clearly understood and articulated. I think about this quite a lot these days. I watch myself, I observe my teacher education students, and I think back to the secondary classrooms I taught in. The first thing that strikes me is that it’s a slow process. At least it’s slow for me, and I know it’s been slow for many of my students (university and school). Insights or understandings rarely arrive fully formed. For example, as my last few blog posts have documented, my understanding of what Deleuze and Guattari meant by the term ‘body without organs’ kept shifting (and indeed it’s shifted a lot since I wrote those last posts). I’ve had to read and re-read sections of their books. I’ve needed to write the blog posts, in order to allow my emerging thinking to become worded, so that I could sit with it for a bit. I’ve gone through gloomy times when I thought it was too complicated a concept for my brain. I’ve read commentaries and watched some online lectures about Deleuze. I’ve let things percolate. I’ve gone back and adjusted my provisional understanding of the ‘body without organs’. I’ve (finally) written a fictional story about someone wrestling with, and then applying, the concept. It’s been a slow process, never linear, constantly looping back on itself. It’s made me think about the lifecycle of a thought. Jung once compared (in The Psychology of the Transference) the psychoanalytic encounter between doctor and patient to an alchemical process: encounter, mixing of the raw materials, blackening (and seeming death), emergence of the elixir (new life). Joseph Campbell’s ‘Hero’s Journey’ has a similar pattern to it. 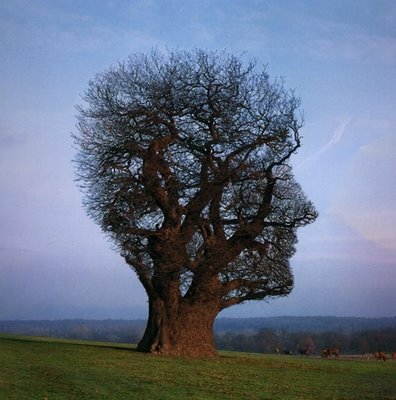 Perhaps the lifecycle of a thought is similar: encounter, confusion, despair, emergent new form. Something like that. The image that comes to mind (perhaps only because Deleuze and Guattari at one point liken the body without organs to an egg) is of the slow process as the matter within an egg takes shape over time, and only emerges into the fresh air once it has gone though countless changes. It is for this very reason that too much of school- and university-based learning is, for many students, not real learning at all. There’s so little time for that slow, hesitant, sometimes distressing (but perhaps telelogically driven) process to take place. There’s a reading and then a quiz, and then the students are moved on to something else. Even the idea of a cumulative curriculum (‘In week 1 we do x, in week 2 we build on x by doing x+1) doesn’t fit what I’m describing here as the more chaotic but still patterned lifecycle of a thought. In October last year, I wrote a series of blog posts as I tried to get my head around Deleuze and Guattari’s Anti-Oedipus. It was hard, sloggy, not-entirely-pleasurable work, and I wasn’t sure that I was making much progress. I tried to find connections between what I was reading and a story I knew, and then to ideas I have about teaching, all interspersed with healthy doses of blind speculation about what D&G were actually meaning. I ended up writing about an article (by Anna Hickey-Moody) that helped make sense of some of it. But then the momentum lost energy, the hard yakka petered out, and I forgot about Anti-Oedipus. I’d read about a quarter of it, but wasn’t moved to read more. Instead I started working on other things. The revision of an article (‘A love towards a thing eternal’) on Spinoza and the lifeworlds of classrooms (which I’ve been working on for over three years now) took a couple of weeks. 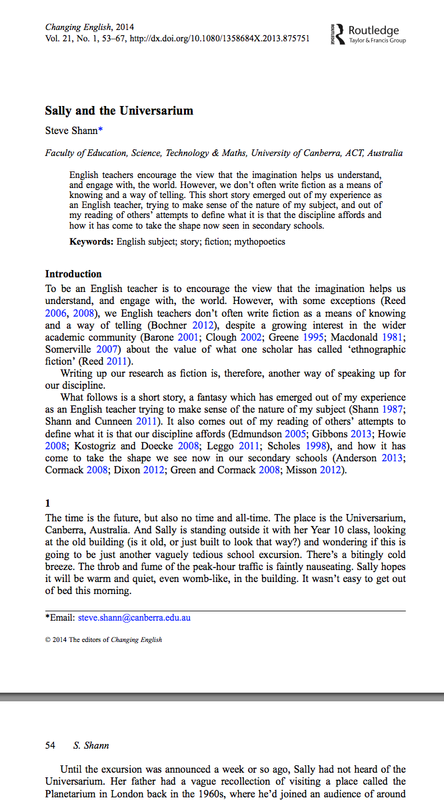 Then I wrote what I hope is a more coherent articulation of the connection between fiction and scholarship (‘A mythopoetic methodology: Storytelling as an act of scholarship’). Finally, over the past month or two, I’ve been writing a couple of the short stories to be included in the manuscript that I’m contracted to submit to Sense Publishers around the middle of this year. It was when I was working on the second of these two stories that I had a mini-epiphany. My break from Deleuze and Guattari wasn’t a break at all; something had continued to work away beneath the level of my consciousness. Not root cause, but what Deleuze and Guattari would call something like the simultaneity of multiplicities each of which represents an assemblage making and breaking connections with other assemblages. Lines of flight, seepages through gaps, planes of immanence, desiring machines coupling and uncoupling with other desiring machines. The surprise was how easily this came out, and how naturally it seemed to describe what this character had been experiencing. This wasn’t me slogging away to try to understand something not-a-little foreign and indigestible; it was me drawing on a way of seeing the world that I had, to some extent, internalised. The epiphany was not exactly that. I’ve known, of course, that lots of learning is like that. You work hard at trying to serve a tennis ball, nothing seems natural but you persist, progress seems non-existent, you leave it for a few days … and then, at the next practice, it’s as if your unconscious has been at work smoothing over the rough bits, making necessary adjustments to the way you think and the way your body functions, and the serve seems to work! The epiphany was more to do with the way we too often undermine this process in our education system by denying the need to just ‘sit on things’ for a while. If there’s a common complaint from most students and teachers, it’s that there’s too much pressure to get content covered. It leaves so little time to let ideas or potential insights settle so that they can then percolate in the background. Too little time to let things be sorted out at some level beneath our conscious awareness. Or for the apparently aimless mulling that we do if we are given some relief from the cancerous need to tick things off on an endless to-do-list. Had I been tested on my understanding of D&G in September (how those two would turn in their graves at the thought of a short-answer quiz on their key concepts! ), I would have done poorly. I’d still struggle, I’m sure, but perhaps not quite as much. I’ve since begun to read parts of D&G’s A Thousand Plateaus. It’s offering up its ideas a little more easily. Is this, perhaps, me becoming a more receptive reader, as a result of what I’ve been describing here? This morning I began a story which I’ve called ‘Sally and the Universarium’. It’s unfinished and unrefined, and perhaps unwisely I’ve decided to post what I’ve done so far. Spurred on by a rather pleasurable hubris, I’ve imagining myself as a try-hard Dickens, and am hoping that by publishing this first ‘installment’, I’ll feel a healthy pressure to finish the story quite soon … though I can already feel it slipping out of my control and wanting to go somewhere other than where I first intended it to go. Over the following ten days, I wrote seven installments of the story, then took it down from the blog, tidied it up a bit, and sent it off to a journal. 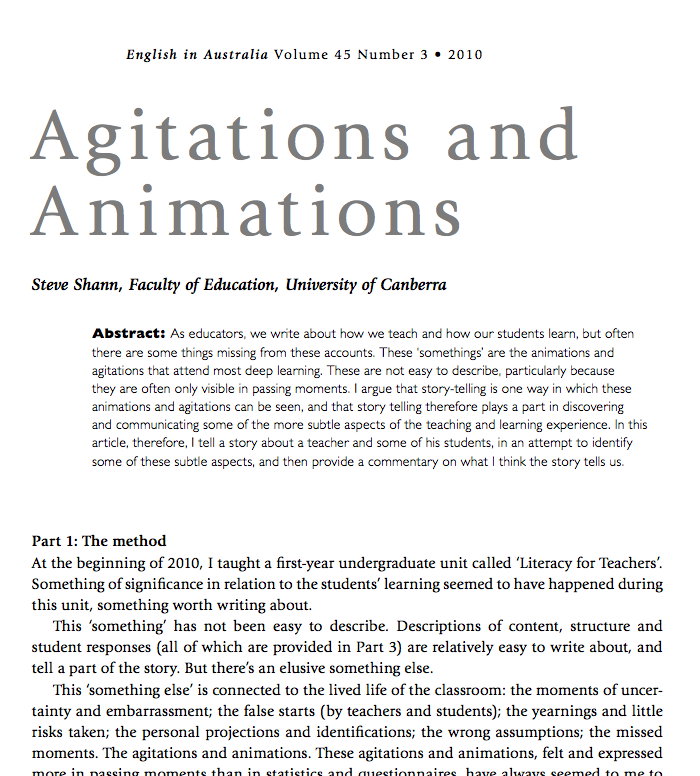 This morning the journal arrived (Changing English: Studies in Culture and Education) with my story in it. Seeing a story or article in print is a special pleasure. But there’s always that worry that it then sits there, between the covers of the journal (or whatever the electronic equivalent is), alone and unread. So I thought I’d write a quick post today, giving a link to the story, and to the other four articles I’ve co-authored over the past few years. This is a story, set sometime in the future, where Sally and her classmates visit an unusual building, the Universarium. Their guide, Wilson, takes the school group through a series of rooms – the Science Room, the History Room, the English Room and so on – which turn out to be very different from what Sally was expecting. 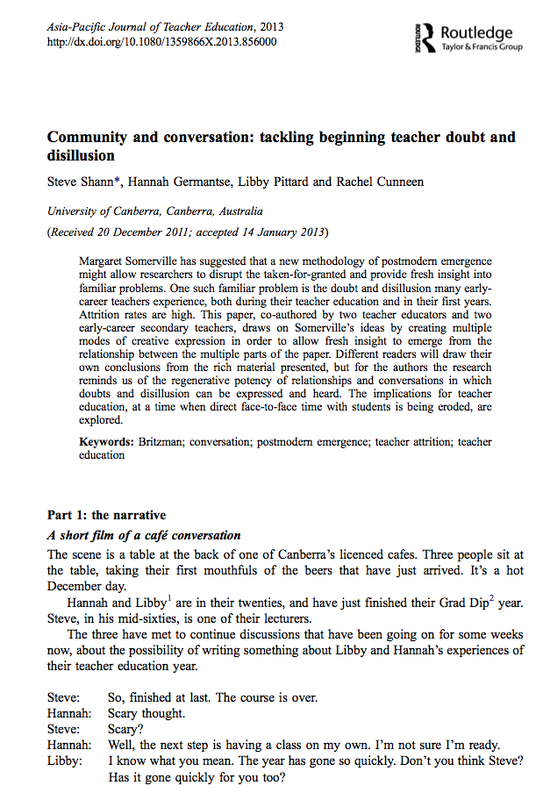 In September, 2012, I discussed, with three of my former Graduate Diploma in Secondary Education students, the possibility of writing some educational fiction together, as a means of exploring some of the tensions and challenges of the practicum experience. The result was a story about a lesson that Allan, a preservice teacher on his first prac at Nullinga High School, gives to an English class. His task is to introduce Shakespeare’s Romeo and Juliet, while his mentor, Susan, observes. Allan loves words and loves Shakespeare and he comes to the lesson with some optimism, despite previous behaviour problems with some of the students. He has a detailed and imaginative lesson plan, and, from his point of view, the lesson goes remarkably well. Susan, however, is critical. The story is about what happens next. 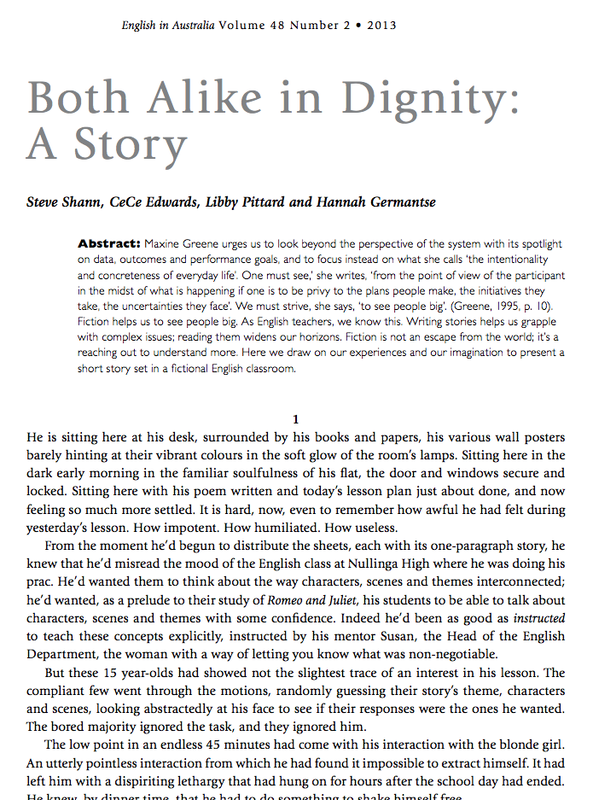 Based on the teacher education course experience of two students (Hannah and Libby), this is a partly playful (we made academics like Deborah Britzman, Jean Clandinnen and Margaret Somerville into characters in some of our scenes), partly heartfelt attempt to highlight the continuing importance of flesh-and-blood, face-to-face contact between staff and students (and student and student) in this era of online learning. and mathematics, history and geography. In this it shares an epistemology with the other creative arts, though our medium – the language of words – is different. Our mythopoetic discourse helps us see the world more fully. At the beginning of 2010, I taught a first-year undergraduate unit called ‘Literacy for Teachers’. Something of significance in relation to the students’ learning seemed to have happened during this unit, and this article is an attempt to write about it. This ‘something’ is quite difficult to pin down. Descriptions of content, structure and student responses are relatively easy to write about, and tell a part of the story. But there’s an elusive something else. This ‘something else’ is connected to the lived life of the classroom: the moments of uncertainty and embarrassment; the false starts (by teachers and students); the yearnings and little risks taken; the personal projections and identifications; the wrong assumptions; the missed moments. The agitations and animations. These agitations and animations, felt and expressed more in passing moments than in statistics and questionnaires, have always seemed to me to be essential elements in the learning drama. I’m working this year on the manuscript of a book of short stories, to be published by Sense Publishers. Some of the above will be included, together with other stories set in secondary schools and universities. 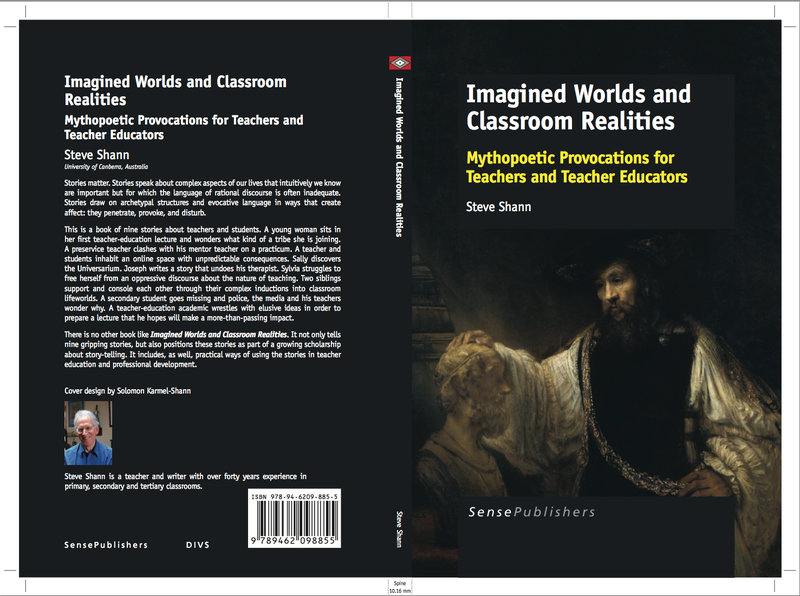 The book is tentatively called Imagined Worlds and Classroom Realities. Scholarship and research: is there a difference? What is a story? What does a story do? Secondary English: lost in the forest?